Osinbajo in Maiduguri hours after Boko Haram attack – Royal Times of Nigeria. 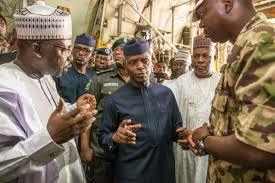 Acting President Yemi Osinbajo is currently in Maiduguri, Borno state, to launch the special intervention relief plan for internally displaced persons (IDPs). Osinbajo’s visit is coming hours after Boko Haram members attacked some towns in Maiduguri, the capital city, burning houses and killing residents. On Wednesday, security agents engaged the insurgents in a gun battle that lasted hours. Though residents were assured of safety, many of them fled their homes. The acting president visited the palace of the shehu of Borno where he said that it matter to President Muhammadu Buhari that IDPs are fed. Under the special intervention relief plan, bags of grains will be distributed to IDPs quarterly.